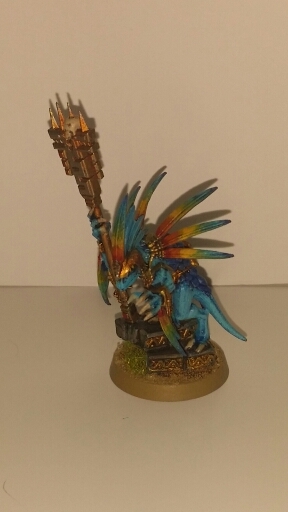 Just a quick one skink star priest done ! Hi so whats been happening in March 2016 ? Need a priest and a few more skinks but getting there for less than £60 with postage I have made a good start. Whilst waiting for the ebay items to arrive i raided the bits box as i am sure i had some lizard parts to see if we could make up anything in the meantime! 2 skinks popped out so we put theae together and did a test paint up. 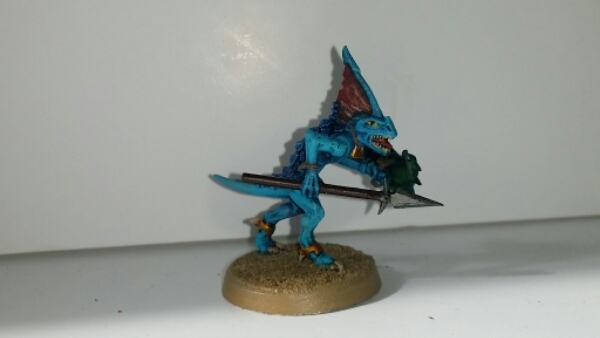 The ebay items arrived so the skinks have been built and are in various stages of painting, finding batch painting useful here as with any small repetitive models, you can make good progress to 20+ models in less than an hour. The Ogre Kingdoms as usual got a bit nearer with another leadbelcher some mournfang, work to the thundertusk and some maneaters assembly and painting. I completed the Araby Maneater, part way through I asked my wife what she thought his gut plate was she said a turkish hat pumpkin, so that explains that in the photo below. 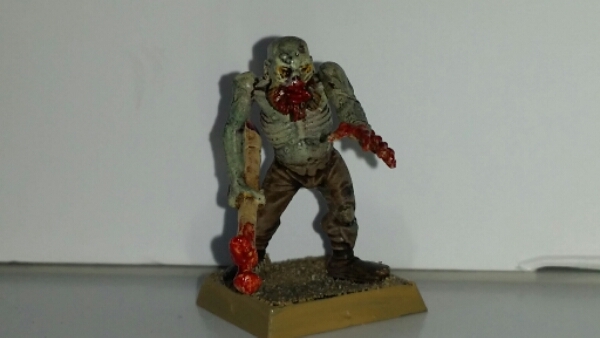 Still need to do his gnoblar and stick it on, Gnoblars are quick to do but I dont like painting them, thats another batch paint for another day. Thanks for reading all the best ! 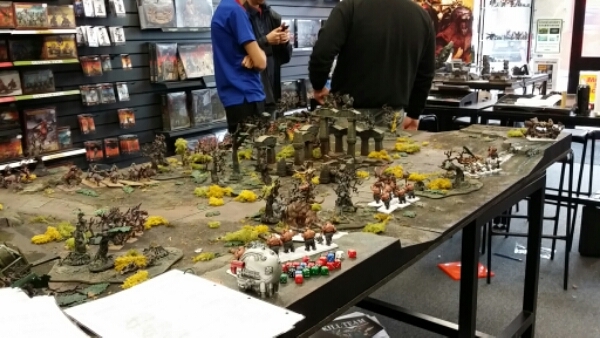 Age of Sigmar – A Question of Balance ! Hi – Welcome to this thread regarding my rambling thoughts of balance for AoS. Currently all of my games have been played using wounds as the balancing factor, what else do we have ? Except model count ? Is model count fair ? Is using wound count truly fair ? Is number of Warscrolls fair ? Is the Balance in the Warscroll ? Lets say this is 40 models for argument sake. My oponent follows the same – this could provide some balance ? However my opponent is one of the Must win at all cost types and takes say 40 large characters or monster types with multiple attacks and massive wound counts. My army is certain of a crushing defeat.! Nothing wrong with my opponents choice I could do the same. Is the wound count truly fair ? This led me to look at 8th edition army lists as a bases for comparing points values to wounds. At least in 8th we had the feeling of balance, although I do not believe even this was perfect at times. Battlescribe currently has not cracked anyway to formulate an Army list in Aos and I am not aware of any other systems that do ! Please enlighten me if I am wrong about this. Have not used Army Builder before. The GW app does not do this and only provides in the my battle tab the warscroll for easy reference, no unit sizes and no total of wound count. It could at least do the latter ! The Alternative ? Currently the community is asking this question. I decided to use battlescribe – (Sorry GW) – To build army lists then using these points -compared each models repective points and wounds on the warscroll, I then totalled the wound count and calculated a ratio of points to wounds. The first army I decided to test was Ogre Kingdoms. I then carried out the same excercise for High Elves and Skaven again just over. In the Skaven selection I used the end times Thanquol and Bone Ripper points value as I assume that is what GW used to come up with the points/wound value on the warscroll. in-balance from this simple data – why not compare for yourself next time you play. The High Elves ratio is the highest price paid in terms of points. 18 points to obtain 1 wound. 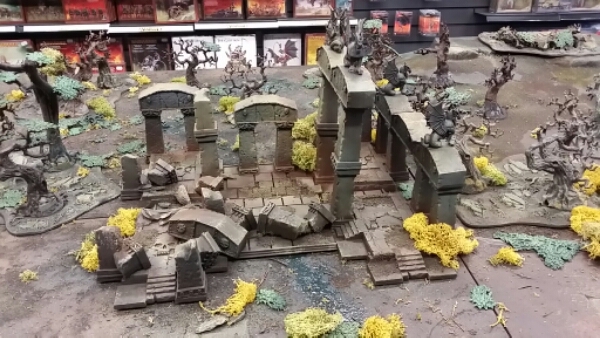 This suggests in Aos an advantage to certain armies. The skaven for the middle points value get the most wounds and indeed models which one would expect from a horde army. I hope to develop the Data further in due course and develop this thread. The warscroll count could be considered as a balancing factor but again it needs some controls or the opponent could again take 10 of a high wound powerful model. For now my Opinion is that the only balancing factor we have is a blend of 8th edition. Wound – Warscroll count and model count. But above all honesty among players to field an army with agreed structure as in 8th Hero, Lord, Core, special and rare and not to field say 10 of nagash. 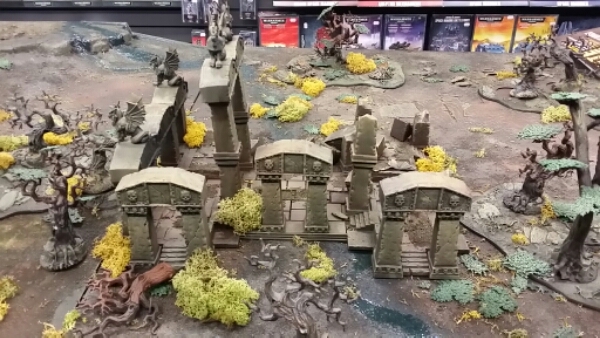 14th October added Beastmen, Vampire Counts and Empire data. (Who said Skaven was a horde ?) Lots of cheap core troops used could be reduced by more knights to reduce model count. So life has kept me busy for a few weeks and I have not been able to paint or play or even blog ! We decided on 100 wounds as the army size. And started taking an interest. When we got home she wanted to play. WoW cant believe that one (now to get her to watch starwars episode 1-6 in anticipation of episode 7) and more to post from our games ! 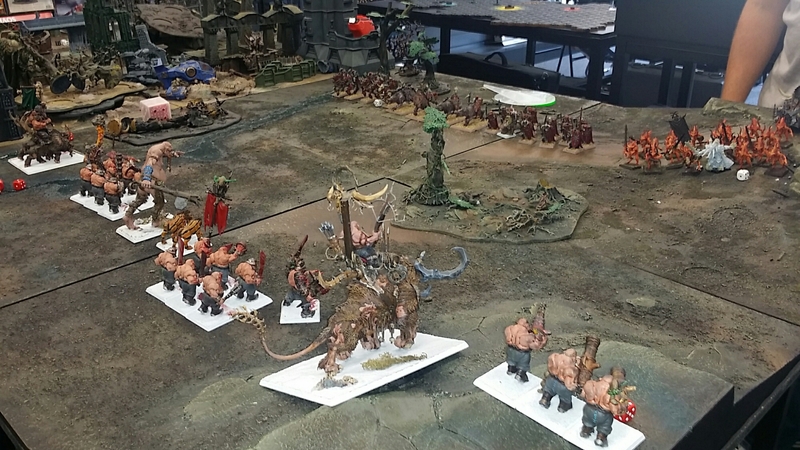 Minor change to my Ogre Kingdoms army swopped the firebelly for a butcher, and the chaos army of my opponent dropped chaos warriors in favour of another wizard and 3 spirit hosts. It was a long game 4 hours. Very enjoyable so much so that no photos where taken. 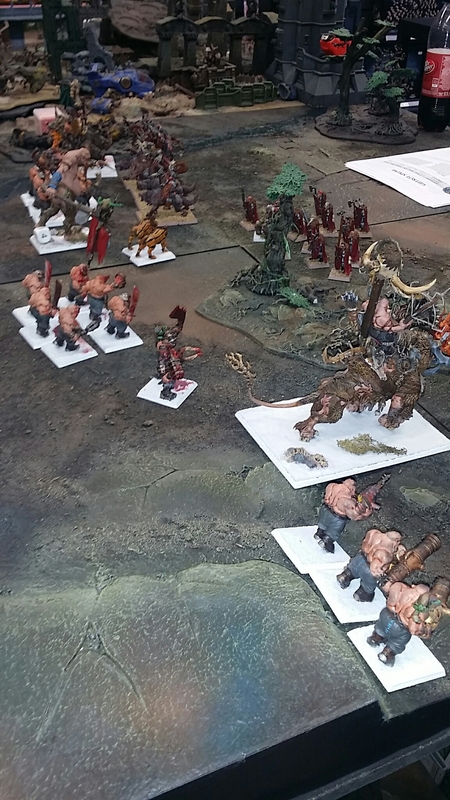 At midway it looked like an Ogre Kingdoms Victory but due to several respawning of chaos demons and a tactical move of protecting his Hell cannon from my Mourfang and sabretusks with said respawns, preventing them from getting to it. My opponent was able to collapse both my flanks. Once the Tyrant, and Giant had gone. And the Butcher next then the stonehorn the result was inevitable. My poor old Ogres limped of Hungry again. The repeater bolt thrower was as usual devastating. Charge in 6 attacks and fly away. Without any real shooting abilty as only 60 pointd the ogre’s struggled to reach the eagle to make a kill. The stonehorn vs the prince on a dragon was a fairly even affair the dragon just tipped the stonehorn with some help from the bolt thrower. The tyrant finished off the dragon. 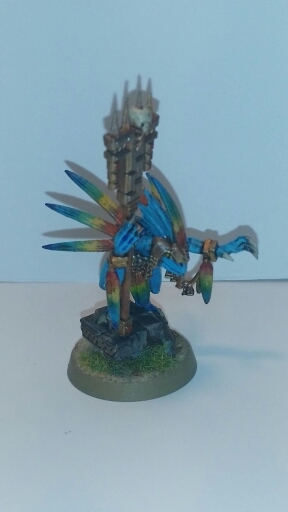 The eagle finished of the iron guts and Tyrant with the mage and bolt throwers help. The Giant took out the ellyrian riders after their charge caused 5 wounds to the giant. The bolt thrower finished off the giant who fell and did injure the eagle and kill one remaining reaver. 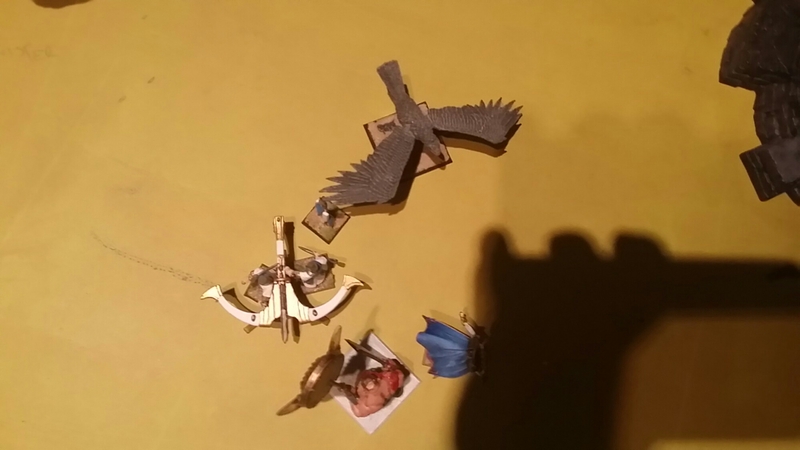 The mage and eagle and finished off the standard from the ironguts as he charge the bolt thrower. The fight ended up very close run at the end. Doh ! Another loss for the Ogres but I am doing better the Butchers maw went of well several times. The ironblaster performed well, I discounted it after the first game but its back in. The iron guts are a must they take and give so much punishment. The leadbelchers got bogged down in combat dispite my beat attemots to keep them out of the fray, those pesky chaos wizards can just summon more troops right in and personal to your troops they got some good shots off but in the end fell. All in all a close run game again. 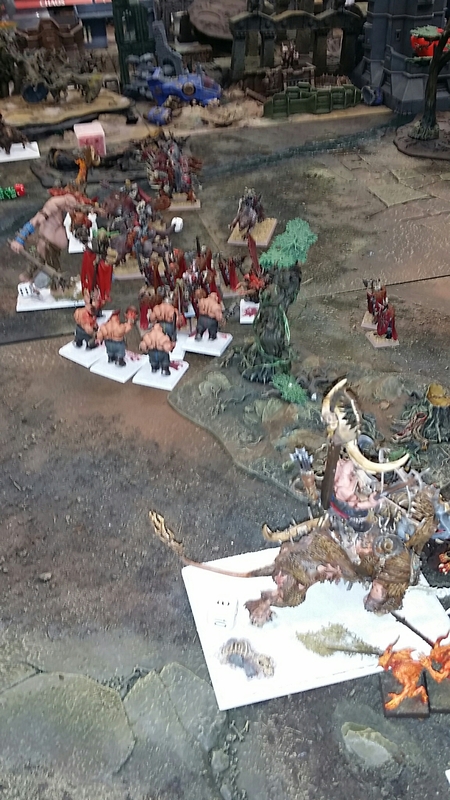 But Chaos just kept regenerating and eventually ground the poor old ogres down. Tried some Gnoblars only 10 for the crack. which were an annoyance to my opponent and held for 2 rounds. Will need 50+ of the little green buggers to get some decent attacks in though as they need such high rolls and have a 6+ save. Cant wait to paint those ! Worse than clanrats ! Good looking board this one. Firstly I would like to say that these miniatures are really well produced and have barely any mould lines are fun to construct and are wonderful models. If I may I have few critisims though – some of the parts are very delicate and will not stand up to the rigours of transport and play no matter how careful the player is. The models are formed to help with assembly although are going to cause issues for some people due to there delicate nature. Think about what you are doing and dont rush in. And Korgaraths Head. There seems to be a lot of tension in these sprues ! Although not a disaster if you do ! I have and would prefer if I hadnt as this would make painting easier and neater around the saddle area. The wings are very delicate and I toyed with the idea of magnestising them. With a 2mm Rare Earth Magnet. I havent but I have magnestised the underside of the base with magnetic sheets so that I can store them upright in my storage boxes which have a magnetised base to them. The wings are also very delicatly formed to the joint where the two attach to each other. I would recommend superglue activator here. It is best to paint these seperately attach later and snag the join to the arm. I have found that the joint to these is difficult to attach even with strong superglue such as gorilla. Again I recommend investment in a can of superglue activator here. GW could of provided a better pin to fit the hole at the elbow. 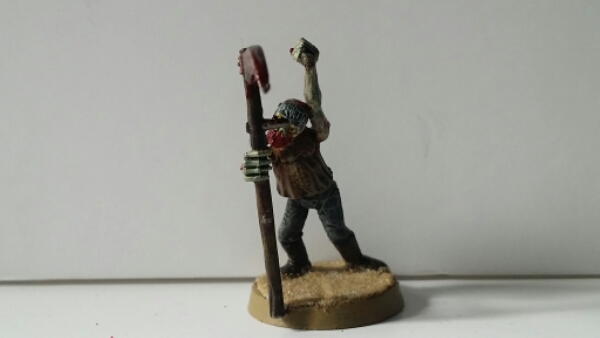 With this mini I recommend assembling the hound and lord seperately and not attaching until you have base coated them. With the lord leave off the armour and cloak and base coat seperatly. Paint the hound to near completion then attach all to the base using a dry fit first to ensure that the collar and chains line up and you get a good fit with the lords arm. Attach the base coated cloak and armour to the lord and finish. So having purchased AoS yesterday and only managing to assemble half of the lord celestial my son and I decided to have a game. Our main objectives were to learn the rules. Play until a clear winner emerged. Not allow for now the more out there rules such as sudden death, and the amateur dramatic boosts such as facial hair, Mirrors, Dancing and talking to models like prince Charles talking to his plants, these seem like fun but can come later. We divided the table straight down the Middle and gave the high elves the Dreadstone blight for the mage buff and wood. The ogres had Skull Island and the other wood. We choose 2 armies Ogre Kingdoms vs High Elves. The game works well is fun to play. And truly has for us an important style which is beer and pretzels for us its iron brew and cheese puffs ! We need to work out and play with more of the rules before we can use effectively. Rules such as magic which seem a bit vauge and innefective to us. Purchased Age of Sigmar today. First impressions of the models are they are excellent sculpts. Some delicate parts but with minimal clean up and mold lines. I intend to base coat them using an airbrush which is something I need to practice. Therefore we will see hows this goes in this blog entry. Pictures to come soon when some progress is made.